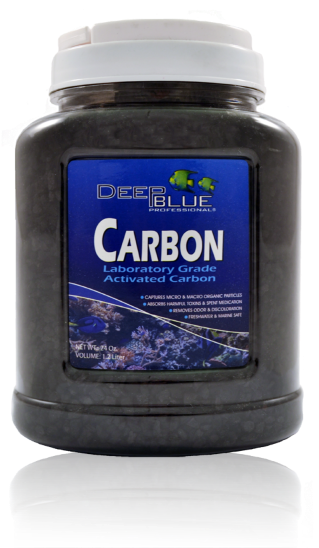 Deep Blue Professional* Activated Carbon In Jar With Media Bag Activated carbon filter media aggressively adsorbs organic pollutants from medicines and metabolic wastes, detoxifies harmful gases and removes unwanted colors or odors from your water. Coal based activated carbon is more porous and affects your pH less than coconut based carbon. We recommend medicating sick fishes in a separate quarantine tank, but if you have to use your main tank, remove carbon first and replace afterwards to remove remaining medicines. Carbon removes trace elements needed for plant and invertebrate growth, so make limited use of it in planted and reef aquariums, and always monitor your water conditions. 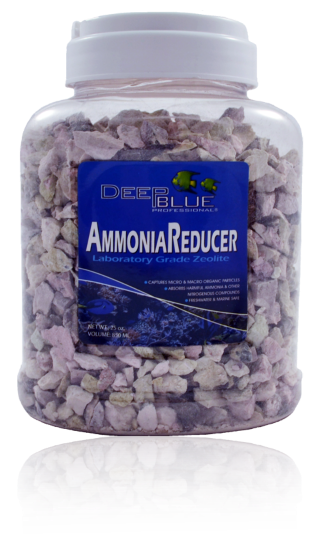 Deep Blue Professional Ammonia Reducer In Jar With Media Bag Laboratory grade zeolite is an essential filtration additive used in aquatic fish keeping which safely reduces harmful levels of ammonia & other nitrogenous compounds. The large surface area on zeolite granules promotes colonization of beneficial bacteria essential to a healthy aquatic enviroment. Safe for both freshwater and marine aquariums. 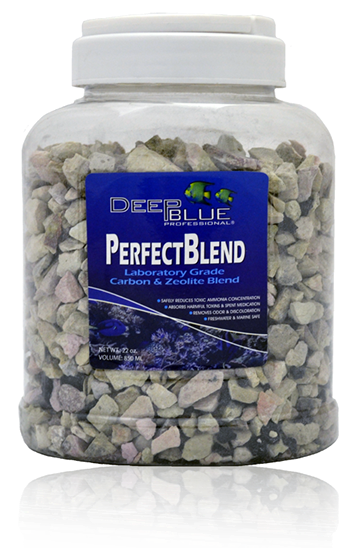 Deep Blue Professional* Perfect Blend In Jar With Media Bag Our filtration media keeps things clean. The filtration media jars formula offers laboratory grade activated carbon and amonia reducing zeolite in a 50/50 blend. Filtration media pads are available in carbonn, advance polyfiber, ammonia reducers, nitrate reducers and phosphate reducer formula. 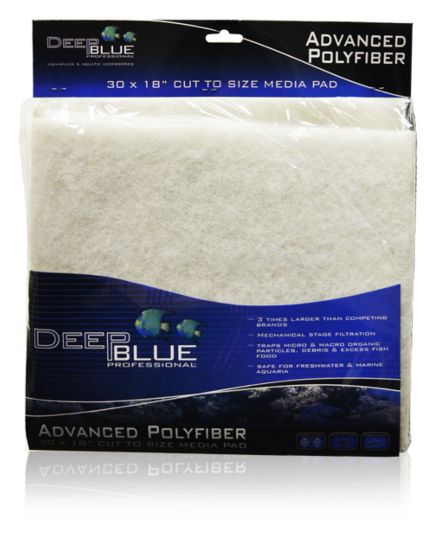 Deep Blue Professional Plain Polyfiber Pad 18x30" Cut to fit media pads traps micro and macro organic particles, foreign debris, and excess fish food. 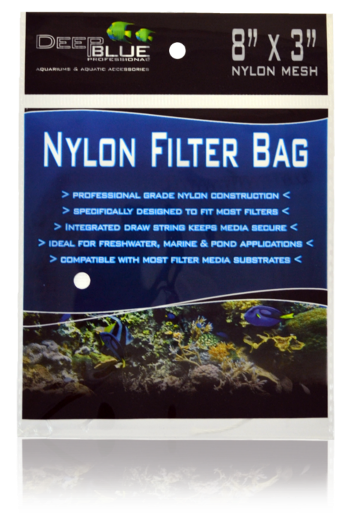 For use in custom sumps/refugiums, hang-on filters, prefilter boxes, and more. Safe for both freshwater and marine aquaria. Mechanical stage filtration 3X more pad than other leading brands Promotes a healthy aquatic environment. New thicker, more rigid design for extended use. 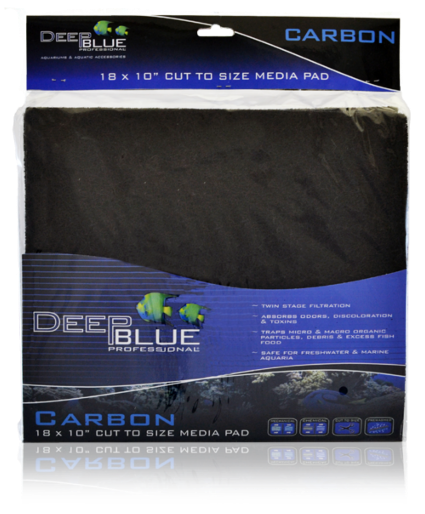 Deep Blue Professional DB Activated Carbon Pad 18x10" Cut to fit media pads traps micro and macro organic particles, foreign debris, and excess fish food. For use in custom sumps/refugiums, hang-on filters, prefilter boxes, and more. Safe for both freshwater and marine aquaria. Chemical & Mechanical Dual stage filtration Absorbs odors, discoloration, and toxins Promotes a healthy aquatic environment. New thicker, more rigid design for extended use. 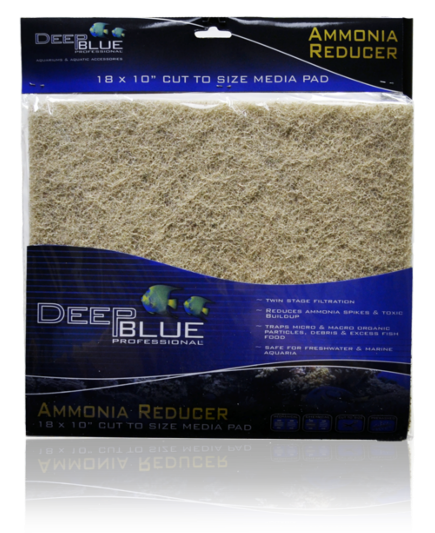 Deep Blue Professional DB Ammonia Remover Pad 18x10" Cut to fit media pads traps micro and macro organic particles, foreign debris, and excess fish food. For use in custom sumps/refugiums, hang-on filters, prefilter boxes, and more. Safe for both freshwater and marine aquaria. Chemical & Mechanical Dual stage filtration Reduces ammonia spikes and toxic buildup Promotes a healthy aquatic environment. New thicker, more rigid design for extended use. 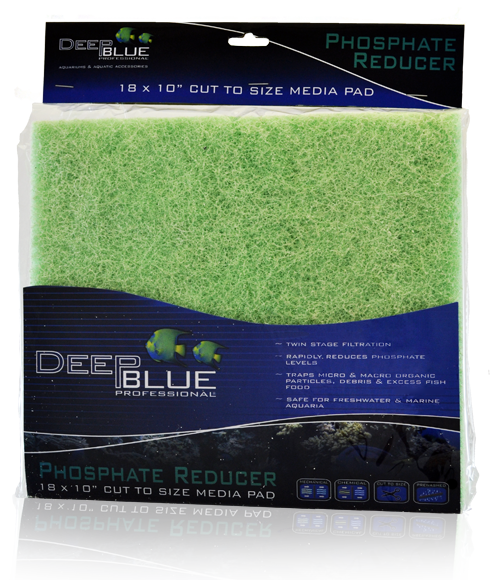 Deep Blue Professional DB Phosphate Pad 18x10" Cut to fit media pads traps micro and macro organic particles, foreign debris, and excess fish food. For use in custom sumps/refugiums, hang-on filters, prefilter boxes, and more. Safe for both freshwater and marine aquaria. Chemical & Mechanical Dual stage filtration Rapidly reduces phosphate levels Promotes a healthy aquatic environment. New thicker, more rigid design for extended use. 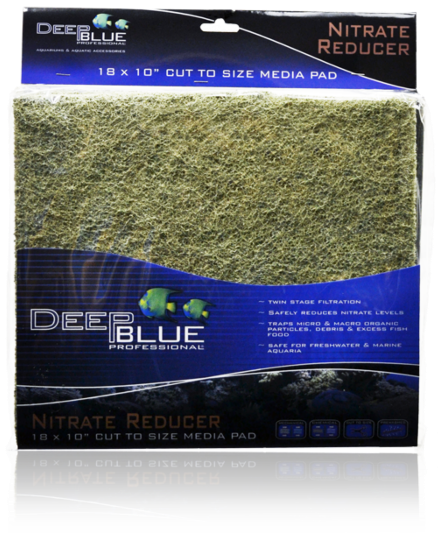 Deep Blue Professional DB Nitrate Pad 18x10" Cut to fit media pads traps micro and macro organic particles, foreign debris, and excess fish food. For use in custom sumps/refugiums, hang-on filters, prefilter boxes, and more. Safe for both freshwater and marine aquaria. Chemical & Mechanical Dual stage filtration Safely reduces nitrate levels Promotes a healthy aquatic environment. New thicker, more rigid design for extended use.  Deep Blue Professional 4 Inch Prefilter Sock Advanced 200 micron pre-filter sock traps micro and macro organic particles, debris, and excess fish food. Freshwater and marine safe. Deep Blue Professional 7 Inch Prefilter Sock Advanced 200 micron pre-filter sock traps micro and macro organic particles, debris, and excess fish food. Freshwater and marine safe. 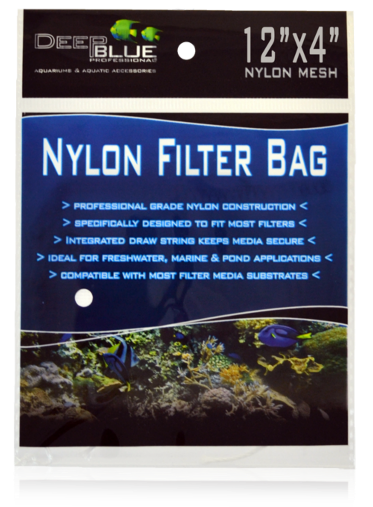 Deep Blue Professional Nylon Mesh Media Bag 3X8 Sturdy nylon mesh bag keeps filter media contained with drawstring closure. Deep Blue Professional Nylon Mesh Media Bag 4X12 Sturdy nylon mesh bag keeps filter media contained with drawstring closure.